Vaping has become a very popular way of smoking both tobacco and weed, as vape pens are highly efficient and easily transportable. In this article, we will look at how to use a vape pen, what different kinds of the pen are available, and why you might choose to vape over smoking. We will also review some of the different vape pens currently on the market. Where should I buy a weed vaporizer from? Most vape pens come with rechargeable batteries, so it is important to fully charge the batteries before use. Naturally, read any directions that come with your pen, and follow them! With a brand new pen, you will need to take it outside and switch it to the highest heat setting to burn off any factory residue. Then grab your ground up the herb and fill your vaporizer (or place it in a cartridge). Switch it on, and wait three to 30 seconds before you take a hit. Start puffing gently, especially if you have never used a vape pen before, as the delivery is stronger and purer than a regular joint. After smoking, it is important to clean your vape pen regularly. Every kind of pen comes apart for cleaning purposes, so check your pen’s directions for how to do this. You can also vape using table-top vaporizers and hookahs, which involve larger, more expensive apparatus. We will be sticking to vape pens in this article for the sake of simplicity. There are two main types of weed vape pen: those that heat up marijuana oil called Butane Hash Oil (BHO) or “dabs”, and those that heat up dry bud. Oil vape pens will produce a stronger high and come with a word of caution: some of the ingredients such as propylene glycol and polyethylene glycol which are used as thinning agents have not been FDA-approved for inhalation. With premium vape pens you can smoke both oil and dry herb. All you have to do is swap the insert at the bottom depending on which form of cannabis you want to smoke. 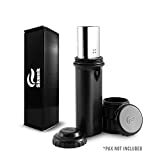 You can also buy accessories for your vape pen, such as herb grinders if you smoke dry herb, and vape pen cases. Storing your pen in a case will keep it safe and will help it last longer. Vaporized cannabis is a lot stronger than smoked cannabis, as it is rich in THC. Vaping tends to be safer as the weed is heated rather than burned. This means there are almost no carcinogens the in vapor, decreasing the risk of lung and mouth cancers. Vapour doesn’t smell like cannabis smoke does, so you won’t stink up the place when you take a hit. In the long run, vaping is cheaper than smoking. When vaping dry bud, you can use the already vaped bud to make cannabutter or cannabis oil and cook with it. Now let’s get onto the reviews! This weed vaporizer is one of the best value for money vapes around. It can handle both dry herb and oil cartridges and heats up in only 20 seconds. It heats the weed evenly, so the quality vapor remains consistent. The battery charges quickly, only needing 30 minutes to give you 10-15 five-minute vape sessions. This pen is powerful too, with temperatures between 100 and 430 degrees Fahrenheit (38 and 221 degrees Celsius). However, these high temperatures don’t affect the vapor, which remains smooth and cool. There is an LED display which shows you everything from temperature to battery charge level. It comes apart for easy cleaning and comes with a 3-year warranty (and a 1-year warranty on the battery). The Boundless CFX is great value for money and incredibly versatile, making it perfect for any cannabis consumer. This pen is also capable of vaping both oil and dry herb, with a heating time of 15-20 seconds and a variety of heating modes to best enjoy your herb. It comes with medical grade components, Bluetooth smartphone control, and a 10-year warranty! The PAX 3 has a sleek, minimalist appearance, and it vibrates too! You can also choose from an array of color options if you want to match your pen to your outfit. The Firefly 2 has one setting for smoking wax concentrates, and five different settings for vaping dry herb. This pen is one of the fastest heating pens around, only needing three seconds to heat your bud! You can control the temperature using a free downloadable mobile app, which is pretty cool. It comes with a 2-year warranty and is available in a variety of different colors. It is also super lightweight at only 140 grams (0.3lbs). This pen is also capable of vaping both dry bud and oil and has a super long battery life (3 hours and it’s rechargeable!). The Ascent has its temperature control on the pen itself, so there is no need for a mobile app. One great feature is that it has an all-glass vapor path, giving it a silky smooth smoke. This pen is only for dry herbs but has a wide temperature range of 200 to 428 degrees Fahrenheit (93 to 220 degrees Celsius) to accommodate all your smoking preferences. Despite its small size (weighing only 0.55lbs or 250g), it can hold 0.75g of weed in the chamber. It comes with a rechargeable battery and a discrete ceramic chamber for your bud, as well as a 1-year warranty. This pen also just heats dry herb at the temperature you choose, between 360 and 420 degrees Fahrenheit (182 and 216 degrees Celsius). The chamber is made of stainless steel and can hold up to 6 grams of bud inside. The K-Vape comes with a lifetime warranty and a rechargeable battery that lasts up to four hours, and it switches off if it isn’t used for five consecutive minutes. Its simplicity and value for money make it a great vape pen for beginners. Many people think that Amazon is the answer to this question, but the reality is that there are hardly any weed vape pens sold on Amazon. One highly recommended seller for weed vaporizers is Vapor Nation. They have a huge variety of vaporizers available and have great customer support. They also provide fast free shipping and discreet packaging, and if you find your purchase cheaper online within ten days, they will refund you the difference. Best of luck with your weed vaporizer purchase, and hopefully this article has given you a bit more information to help you make your decision.